You can now “watch” or subscribe to entries in order to be notified by email when there are new comments on them. You can stop watching them at any time by clicking the link in the notification email. To watch an entry, check the checkbox underneath the comment form when you make a comment or click the link at the top of the list of comments for an entry. If you make a comment and wish for it to be deleted by the author of the entry, you can now click a link at the bottom right of your comment and send an email directly to the author of the entry. It is now possible to schedule entries to appear at a time in the future, for example if you wish to maintain a regular posting schedule on your blog or if you wish for it to appear, for example, after a lecture or assignment deadline. When you save an entry as a draft, you can now allow other people to view it before it is published by giving them the link to the draft entry. 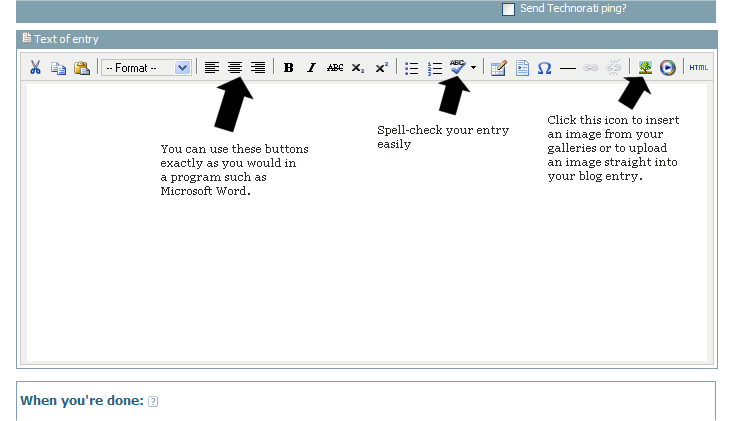 To get this link, click on the title of the entry from the Admin Entries screen. As always, if there are any problems, feel free to comment on this entry. You can now edit photos to touch them up and make them more blog–friendly after uploading them by clicking the Edit image icon in the gallery (or the "Edit image" link on the Admin Your Images page). This will allow you to use a number of tools to perform minor modifications to your image (resizing, cropping, rotating, enhancing, even adding a lomo filter or snow) and save the changes to your blog. There have been a few other minor changes, mainly in that any problems that users have experienced in writing single–line comments or entries and the end being cut off (particularly after using an acronym such as WGA) should not appear any more. There have also been some minor changes to the way that blogs send RSS feeds to help speed up requests if information has not changed, and users can access ATOM feeds of pages by appending /atom or ?atom=atom to the URL. Just a quick reminder: Warwick Blogs, like most other IT systems, will be unavailable for at least part of the coming weekend, Sat 5th and Sun 6th Aug. Depending on the exact order in which the maintenance work is done, Blogs may be gone from as early as Friday evening at 6pm, and may not reappear until Monday morning.